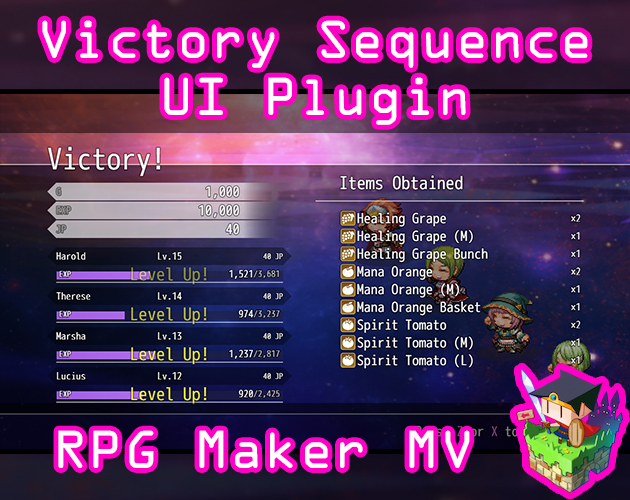 This is a RPG Maker MV plugin that makes the battle system's victory sequence only a single screen. 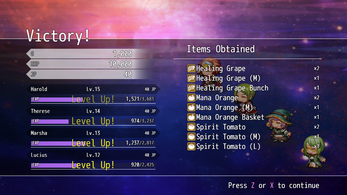 It puts together all of the reward information gained from battle onto a compact screen to display everything at once before the player goes back to the map scene. Be warned that because everything is made to fit onto one screen, some things like displaying the actor's stat gains and learned skills will not be shown due to a lack of room. There are many plugin parameters to set up. Audio: Lets you adjust the settings for the sound effect played when a level up occurs and the BGM that plays during the victory sequence. Transition: There is a brief moment of wait after the battle ends before fading into the victory sequence. These plugin parameters let you control all of that. Background: These plugin parameters adjust the many entities placed on the victory sequence UI. Each one should be named after the section they are responsible for managing. 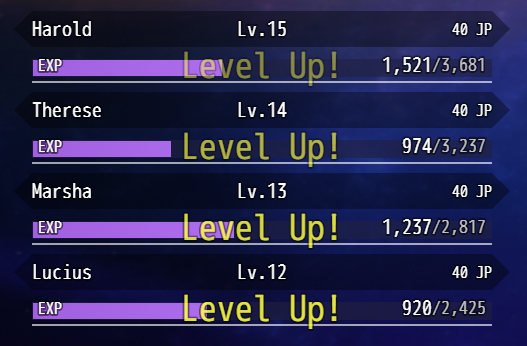 Rewards: These plugin parameters handle the displayed rewards found such as money, EXP, and JP if you are using Yanfly's Job Points plugin. Status Windows: The status windows are in the lower left corner of the screen and they display the actor's progress at the start of the victory sequence to what they become after it. The plugin parameters manage those aspects. Continue Button: The continue button at the bottom right corner of the screen appears after the status windows finish loading. They tell the player how to exit the battle from the victory sequence. This turns on or off the victory sequence. This one matches Yanfly's plugin command so you don't have to change your game's plugin command call if you are switching over. This turns on or off the victory BGM and ME. This one matches Yanfly's plugin command so you don't have to change your game's plugin command call if you are switching over. This plugin is NOT compatible with other plugins that change the victory sequence UI because they are likely to overwrite each other. Sep 25 2018: Victory UI now advances forward with mouse clicks, too. Gauge filling up is now smoother for smaller values.